It is always a good idea to have some mini cards on hand for gift-giving. These are some quick and easy ones created with the Vintologie Stamp & Stencil set #SC0647 and KI Memories mini cards in pink. Using two different Cats Eye ink colors I stamped directly onto each mini card base a different butterfly design. 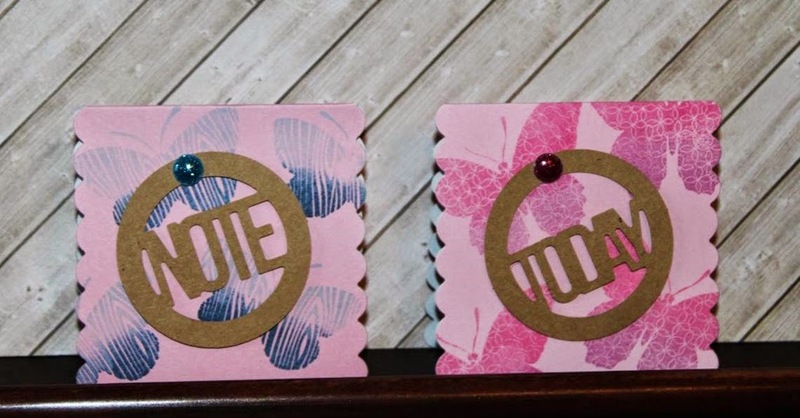 The Note card used two shades of blue and the Today card used one pink ink and one purple ink. After that I added the new Soup Staples III Kraft Circle tags with 3D foam dots. Last step was to add a KI Memories glitter dot over the tag holes. These mini cards are so quick and easy you will want to make a whole stack.